Habitat: Desert. This plant is usually found growing in sandy washes. 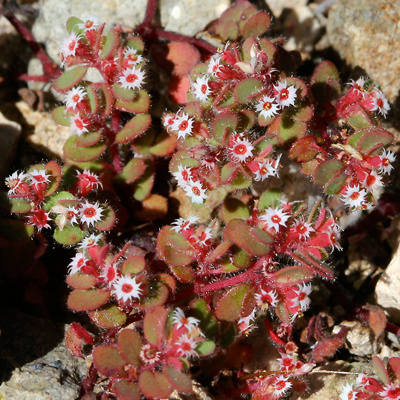 Description: The tiny, unusual flowers have white, petal-like appendages with 3 to 5 distinctive point-tipped lobes and red central glands. The appendages are larger than the glands. The flowers are followed by tiny, hairy, round, lobed fruits. The leaves are small, green to red-tinged, hairy, opposite, smooth-edged, and oblong to egg-shaped. 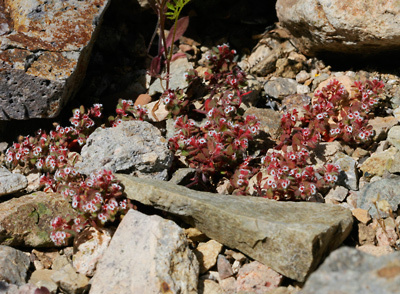 The stems are prostrate, branching, reddish, and hairy.